This past weekend, I was able to attend two Better Beaches Events, Open House at Carson Beach and Family Pride Day in the North End. We talked about water quality at the Open House with the Department of Conservation and Recreation. We tested the pH balance of three water sources: the ocean water at the beach, bottled water, and the drinking fountain. We found that the ocean water was the most balanced at 7.0, the bottled water at 8.0, and the drinking fountain at 8.5. For animal and plant-life to survive, the pH balance level needs to be within a range of 6.5-8.0. If the water is too base or too acidic, then the water may be harmful to animal and plant life. 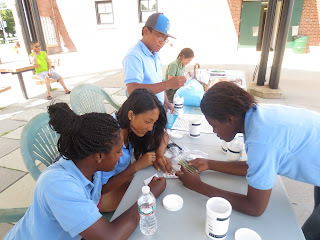 It was really fun to test the water with the JPAs, and I learned a lot about the water in Boston. At the North End Family Pride Day, we brought a touch tank with an authentic Larry the Lobster. We had to be creative to find a water source, because there was no dock on the water. But with one of our JPAs help, Jennifer, I was able to walk over the rocks down to the water and put enough in the cooler to keep Larry afloat. 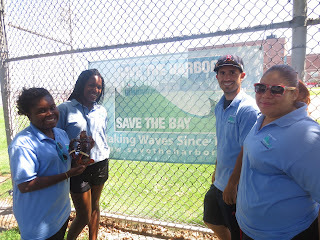 Our Save the Harbor table was set-up next to the travelling petting zoo, and it was great to see the young children playing with the farm animals. Thanks to the North End Against Drugs we were able to enjoy a bratwurst with peppers and onions during the festivities. We were even able to hear an all-male acapella group. It was a fun event to enjoy with our Save the Harbor Staff.